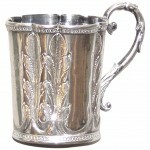 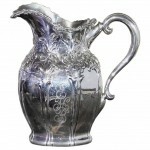 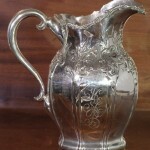 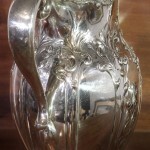 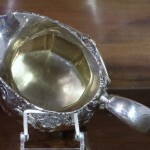 A very fine and heavy engraved and repousse’ ornamented sterling pitcher. 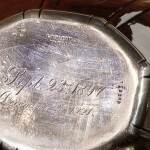 It is American and while it has all sorts of writing on the bottom it does not have a maker’s mark. 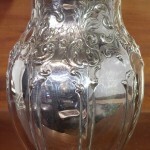 The marks on the base are “3 pint, 925/1000, 2288, September 23rd 1897, sterling silver, December 25, 1921” Each side has a monogram “EHB,HAB” It weighs a hefty 26.25 Troy oz. 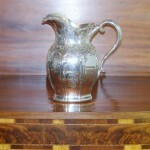 Excellent estate condition. 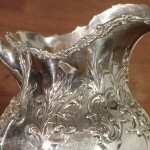 Only tiny imperfections.